Boston�s Handel and Haydn Society was founded in 1815 and Christopher Hogwood became their director in 1986, when they moved to performing on period instruments. They recorded Handel�s Op. 3 Concerti Grossi in 1988 and went on to record the Op. 6 Concerti Grossi in 1991. Avie have now reissued both recordings in this boxed set. This pairing of both sets raises some interesting issues regarding the primacy (or not) of the printed text over the composer�s autograph. Handel came to publishing late and much of his early work, if printed at all, was issued in pirate editions. There are indications that John Walsh�s publication of the Op. 3 set was originally going to be a pirate edition, but in the end it was issued with Handel�s imprimatur. But quite how much Handel had to do with the set is debatable; Walsh undoubtedly had access to Handel�s manuscripts but it was Walsh who made the selection ... and published the wrong closing movement for Concerto no. 6. Handel certainly did not re-work the material for publication as he did for the Op. 4 Organ Concertos which Walsh issued after the Op. 3 Concerti Grossi. So it should come as no surprise that he wrote the Op. 6 Concerti Grossi for publication. Well, up to a point. In fact, he needed a draw for his 1739-40 season; his first season of all-English, unstaged works. So the Op. 6 concertos, with their Op. no. recalling Corelli�s Op. 6 set of 12 string concertos, were designed to appeal to the London cognoscenti. For his theatre performances Handel performed the Op. 6 Concerti Grossi with wind parts, though they were printed as just string pieces. On this disc, the Haydn and Handel Society ignore Walsh�s edition of the Op. 3 concertos and return to Handel�s orchestrations from manuscripts ante-dating Walsh�s publication. They also play the correct movements for the 6th concerto. But for the Op. 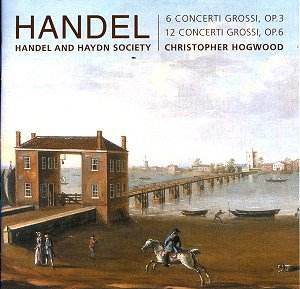 6 Concerti Grossi they ignore Handel�s apparent intentions with regard to wind parts and play the works just with strings. So for the Op. 3 concertos, printed with Handel�s imprimatur if not his direct involvement, they perform according to Handel�s manuscript intentions. But for the Op. 6 set they ignore his own performances and stick to the printed score. These picky little details need not matter if the performances are good. And with works as great as these there is plenty of room for a variety of interpretation. The recording of the Op. 3 concertos was made with 14 violins, 5 violas, 4 cellos and 2 double basses. The results are crisp, lively and attractive, with some lovely solo playing. But what struck me most, compared to a performance such as that recorded by Tafelmusik and Jeanne Lamon, was the sense of comfortable amplitude as if recorded by a bigger group - even though Tafelmusik are only slightly smaller. Tafelmusik�s performance is crisper and more incisive, whereas Hogwood and the Haydn and Handel Society seem to be more mellow and equally appealing, though there are occasionally hints of instability in the string ensemble. The feeling of mellow amplitude carries over into the Op. 6 Concerti Grossi. Compared to Pinnock�s recording with the English Concert, the Haydn and Handel Society provide a smoother string tone with more depth. They have a soft grained delicacy in the solo sections and there is a lovely sense of line in all the string playing. Whereas the English Concert are crisp with lively articulation, the playing vivid, more articulated than the Haydn and Handel Society. I enjoyed the performances immensely and they provide a nice contrast to my existing favourites. It is enterprising of Avie to rescue them from Decca�s vaults.